In the last post, I wrote about the importance of a healthy relationship with the CRM supplier implementation team. This cannot be understated. I stated this is one of the key parts of a CRM implementation project. Your staffing is another one of the more critical ingredients of a non-profit organisation’s CRM implementation. Getting it right is essential. Have the appropriate level of staff on the non-profit side for the course of the CRM implementation. Hire the right people for the right positions for the CRM implementation. Ensure job descriptions for all team members are written, communicated and understand. Reassess positions for the time when the supplier is completed with the implementation and you are on your own. A CRM project may seem completed when the supplier finishes the implementation, but the project will require ongoing staffing to ensure adoption and use by your end users. Non-profit organisations often times believe a CRM implementation is the single responsibility of the CRM implementation firm. This is not the case. Sure, you are paying the supplier a healthy sum of money to deliver a service and, as stated in my previous blog post, suppliers have a huge responsibility to ensure they deliver for your organisation. At the same time, every organisation has a responsibility to themselves to make certain you are properly staffed to deliver the project. To assume this is the supplier’s sole responsibility is both naive and irresponsible. Think through your staff in two respects – for the implementation project and for post-Go Live. Be flexible and make adjustments along the way. When purchasing a CRM, you are purchasing a relationship. Get it right. When your organisation is purchasing a CRM, you are not just acquiring a piece of software. You are also purchasing a relationship. You need to get it right. A relationship? That’s right. And, it is one of the most important relationships of any supplier relationships your non-profit will hold. Non-profit staff tell me all the time the reason they like CRM A over CRM B is they really liked the person selling them the CRM. He or she took them to lunch and “we really hit it off”. Or, they connected with the person demonstrating the CRM or who showed the PowerPoint presentation on the first day. That’s nice. Staff of the same CRM supplier should get along and should work well together. The relationship you are purchasing is not with the sales team selling you the CRM. After you sign the contracts and agreements to purchase, you may never see those parties again. The relationship is with the services delivery team and your ongoing account or customer success manager. These are the people who you want to make sure can work in a synergistic way and really know and understand their product and your business. How do you study this important relationship? Ask to meet with the team who will be implementing your CRM for your non-profit organisation. Understand the length of service of each of these employees. Are they new to the supplier and/or new to the product. Newness to either could be problematic for your organisation. You do not want a consultant or team of consultants to be learning about the business, the software, and about the non-profit industry while you are paying top dollar for their consulting services. When conducting reference checks, interview other non-profit organisations about the strengths and weakness of this team. Make sure you talk to staff at all levels of the non-profit organsiation who have worked with the team. Check turnover rates of staff working for the supplier. Study like-sized projects and understand how the team you are offered worked in a similar situation. Check staffing levels at the supplier. Is the one person assigned to your project the only consultant available for the duration of the project? (It happens). This could be problematic. What if the person takes a holiday, has an extended illness, or has some type of family emergency? What if the person burns out and simply needs to take a break from the implementation? Who is there to back them up? Who works for the company and will be available to offer the consultant a sounding board or ideas sharing? Staffing of a CRM supplier make or break a CRM project. Do not go into a relationship with the belief it will all work out or somehow the supplier will make it right. A CRM supplier/non-profit relationship is most similar to getting married to someone. You’ve signed the marriage license (contract and agreement to purchase) and now you need to see how well you live together. Figure that aspect out before you get married. Ask others who have lived with this supplier whether they threw their socks on the floor, took part in the housework, and were easy to get along with on a daily basis. Did they stick to the family budget? Or, were they constantly overspending and asking for more money? Don’t just believe the organisation/referee the supplier puts forward. Go out to at least three non-profit organisations – two of them you surface on your own or through your own network. Remember supplier referees are a bit like your and mine referees in a job interview situation. Are we really going to put someone on our referee sheet who might say negative things about our performance? Spending time on this piece of investigation will pay multiple dividends throughout the CRM implementation process. You may very well learn some negative traits about the supplier through this research. Doing so does not end the prospect of signing the contracts. It gives you the information need to be able to develop a mitigation plan to deal with those trains during the implementation rather than being faced with these surprises and have to scramble while you are meant to be focused on your design, configuration, testing, training, and change management. Staffing a CRM project is critical. This post talked about the staffing from the CRM supplier side. The next blog will focus on staffing from the non-profit side. What are your plans for National Volunteer Week? How about Include a Charity Week? And, finally, Giving Tuesday? Taking advantage of pre-planned marketing campaigns is an important step for Australian charitable organisations. But, many charities do not take advantage of these pre-planned campaigns. Why is that so? Some Australian fundraisers say “Australians do not need to be ‘gimmicky’ the way Americans have that same need”. Others add these types of campaigns are “too American”. I think that is absurd. Organisations have put in a lot of work throughout the year to provide Australian non-profit organisations with a tool kit to execute when the time is right. Charities are forever complaining they lack time and resources. Why not take advantage of the pre-planned marketing campaigns? Why not at least test the campaigns? How do you know something will not work, is gimmicky, or too American, unless you give it a chance. Coming from an American, I would also add while Australia wants to be unique and develop things that are truly Australian. In this case, you are really reinventing the wheel or being penny-wise and und foolish! National Volunteer Week: 8-14 May 2017. Include a Charity Week: 11-17 September 2017. Giving Tuesday: 28 November 2017. It’s important non-profit organisations get on the bandwagon and take advantage of these, and other, marketing campaigns. 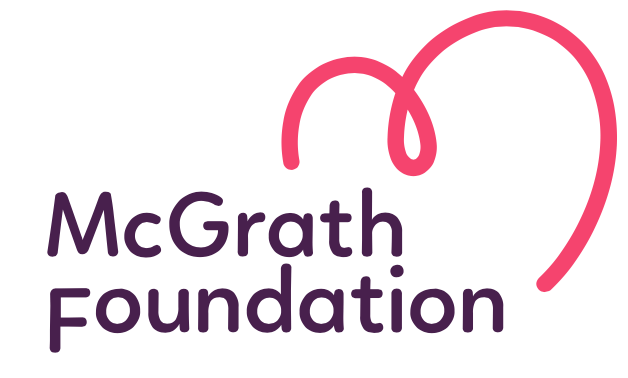 Joining forces will mean non-profit organisations are successful together. The University of Wisconsin has always run very big fundraising campaigns and is strong at stating its case for support. The University of Wisconsin Foundation and the Wisconsin Alumni Association have had great success at mobilising their alumni base to support the university. They do this by telling very good stories. 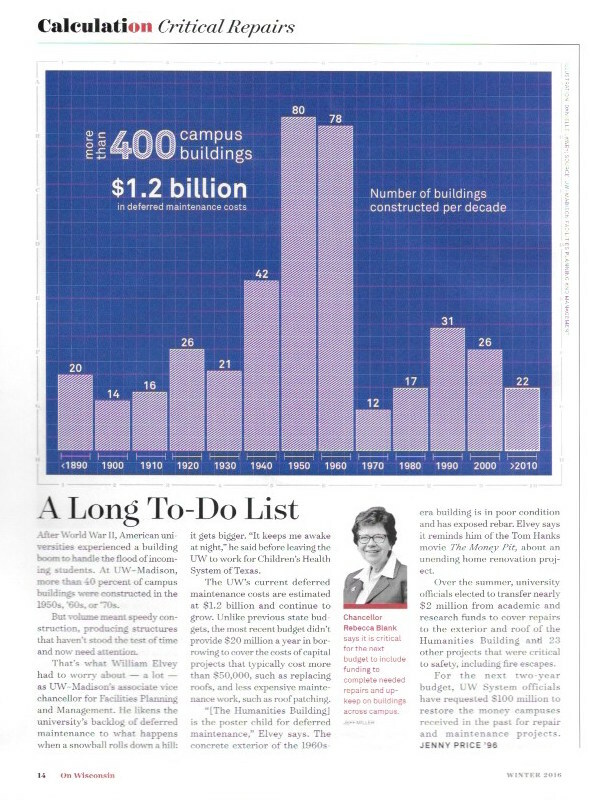 In the Winter 2016 issue of On Wisconsin, Jenny Price ’96 wrote an article called “A Long To-Do List” where “Chancellor Rebecca Blank says it is critical for the next (state) budget to include funding to complete needed repairs and upkeep on buildings across campus”. The article tells the story of a building boom that happened across most American universities after World War II. It states that 40 percent of the UW campus buildings were constructed in the 1950s, 1960s, and 1970s. Those structures, because of the speed in which they were constructed, have not lasted as long as buildings built in other periods. Simply put, the University of Wisconsin has a backlog of maintenance that has to be done. The price tag amounts to $1.2 billion (yes, billion). The Wisconsin state government has apparently not invested in the repairs over the years and has cut back in may other areas, including academics. 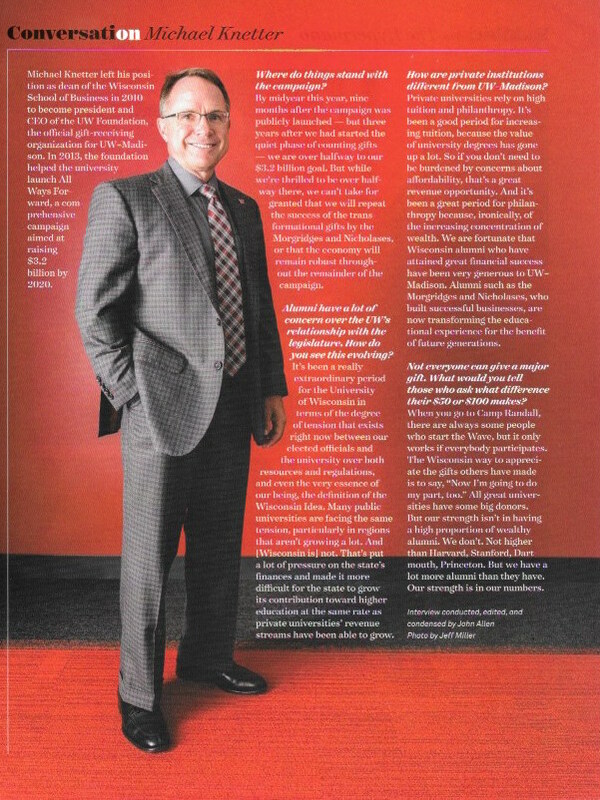 Another article titled Conversation Michael Knetter is an interview with the former dean of the Wisconsin School of Business and now CEO of the UW Foundation. Knetter addresses the concerns alumni have about the UWs relationship with the state legislature. The university is in the public phase of a $3.2 billion (yes, billion) capital campaign. These funds are to be raised by 2020 and the UW Foundation is halfway to this goal. This article ties in nicely with Price’s article and I am sure this is no accident. Both articles really concerned me because they highlight the fact that the Wisconsin state legislature is not supporting higher education in the way the government has in the past. Additionally, the articles highlighted the fact that philanthropy is even more critical for the University of Wisconsin today than it has been in the past. The articles motivated me and, at the same time, left me with a feeling of great nervousness for the University of Wisconsin. In the end, that’s the real purpose of a case for support. Dana Farber asks us to prepare for tax time. 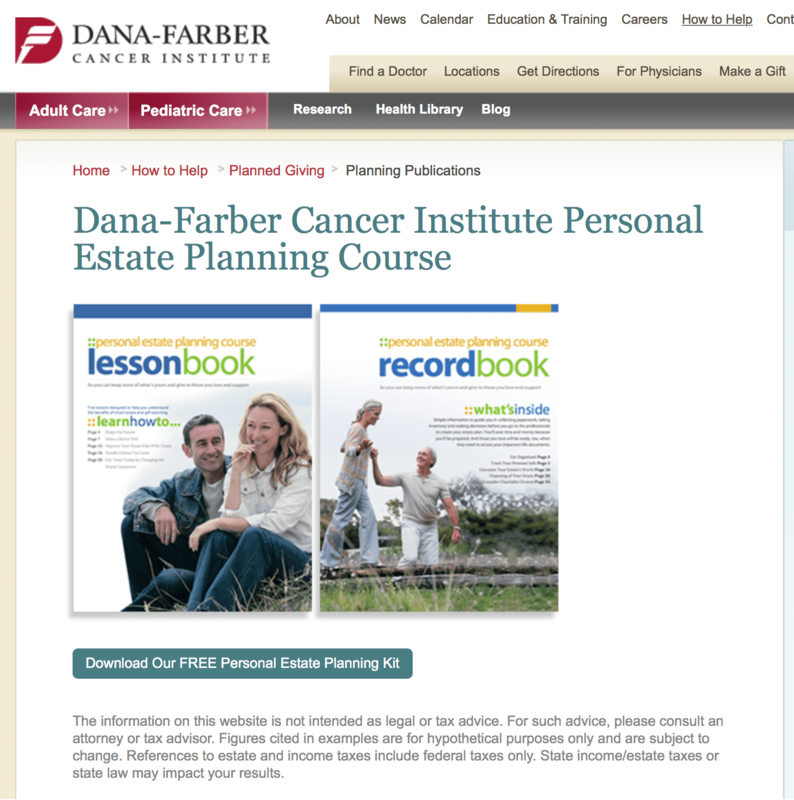 It’s no secret Boston’s Dana Farber Cancer Institute (DFCI) has a solid planned giving department. DFCI, in fact, has a solid all around development program. They are the envy of many non-profit organisations and have had superior leadership over the last 15+ years. In this blog post, I have highlighted why DFCI is in the forefront of fundraising and, certainly, planned giving. 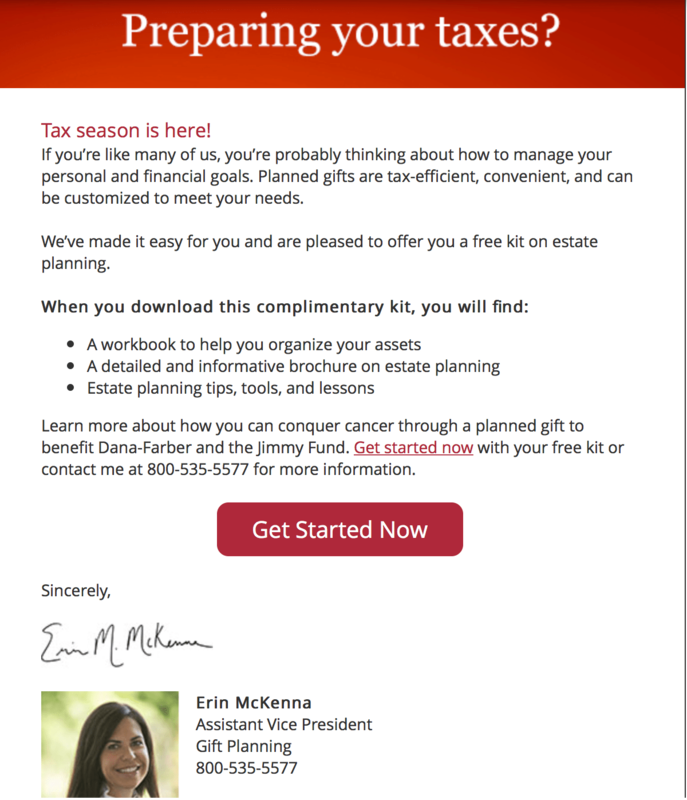 DFCI sent me an Email last week suggesting planned gifts are “tax-efficient, convenient, and can be customized to meet your needs”. The average US taxpayer is in the process of preparing their 2016 tax return (due on 15 April), the DFCI Email is timely and is surely to be effective in helping their supporters to think about DFCI and ways to minimise tax. Planned gifts in the United Stated go well beyond bequests. The DFCI Email points out a number of planned giving vehicles available through DFCI, including: Gifts through your estate: Wills and living trusts, beneficiary designations, account designations; Gifts that provide you income: Charitable gift annuities, charitable remainder trusts; and More ways to give: Charitable lead trusts, real estate, and endowed gifts. DFCI certainly has a menu of planned giving opportunities to offer supporters. These are planned giving vehicles unheard of in the average Australian non-profit organisation (even amongst the largest and most sophisticated charity). DFCI suggested I download one or two of their booklets, including a lesson book and a record book. I downloaded both after first being asked to provide some basic contact details including my name and Email address. DFCI now has a means to contact me and has provided me something in return. What’s in your letterbox today? A few bills? Some charity appeals? Advertisements for the latest pizza restaurant in the neighbourhood? I received an envelope from Bluestar Direct on Tuesday afternoon. I suspected the envelope contained a follow-up sales piece related to the Fundraising Institute Australia (FIA) Conference two weeks ago. Like you, I’ve received a few emails and mailings from suppliers since the FIA conference concluded. But, it was not a sales piece. The envelope contained a letter from Mr Lindsay May recognising my being elevated as a Fellow of FIA at the recent FIA conference. Many of you know Lindsay May. He is a class act. Lindsay has done much for our profession, for FIA, and for countless organisations and fundraisers over his career. To receive a letter like this at the end of a long work day touches me beyond words. It is letters like these that you and I should write more often. Letters of congratulations, notes of thanks, and other personal outreach to donors, prospects, and colleagues mean so much to the recipient. This is personal touch, which is lacking, especially, in this day in age when SMS, voice mail, or Email have taken away the personalisation people crave. 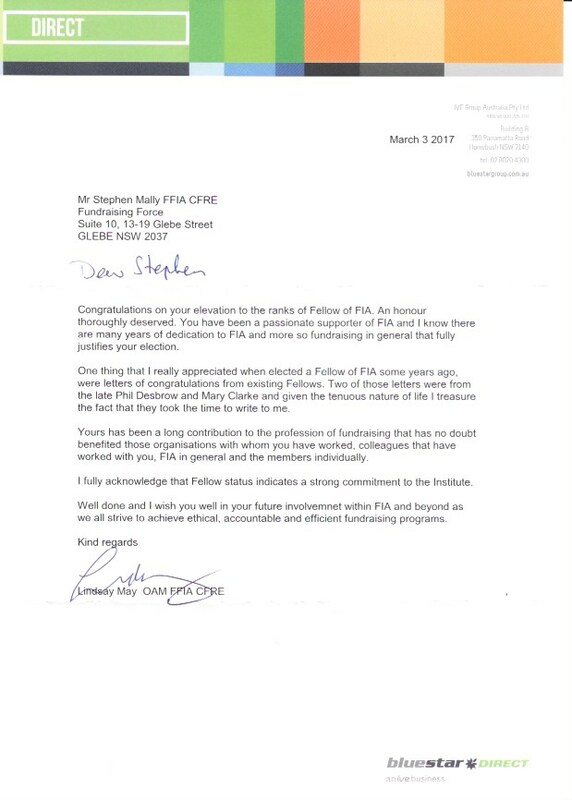 In the letter, Lindsay himself recognised how two people did the same for him when he was named an FIA Fellow. This obviously had a lasting impact on Lindsay. Lindsay’s letter will have the same impact on me. 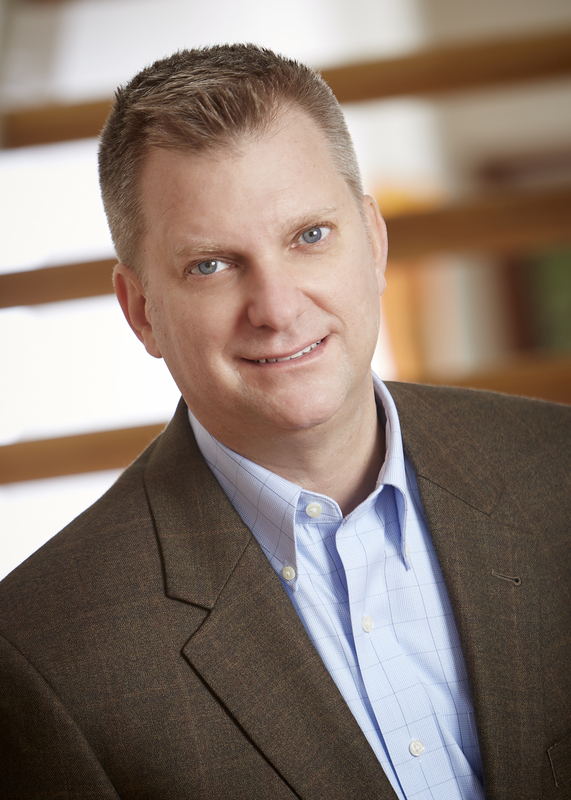 Is your non-profit’s tax appeal file ready? Is your non-profit’s end of tax year appeal file ready for your supplier to create your tax appeal? Have you appropriately segmented the file? It is getting late on the calendar – 30 June is nearly upon us. Many charities take the “easy way out” and send the same tax appeal package to everyone on the data file. These organisations do not take the time to segment the data file in order to test various treatments against one another and to measure and monitor which segments are performing best and which are underperforming. To some, segmentation and data preparation is direct marketing 101. Others would rather have a root canal. Non-profit organisations using tools like The Raiser’s Edge, Salesforce Nonprofit Success Pack, Blackbaud CRM, and others have premium tools at their fingertips. These tools allow for charitable organisations to properly segment each data file. Creating segments such as recency, frequency, and value (RFV) segments may be done in a few hours. Once the RFV segments are set up, you will be able to use the same strategy for marketing efforts into the future. Imagine having your tax appeal set up correctly and deploying the same strategy for the second wave of the appeal and having it in place for the Christmas appeal! Your end of tax year appeal file segmentation does not have to be something you dread. It ought to be considered as best practice. Contact FundraisingForce if you require assistance with your next data file. Throughout the course of the year, FundraisingForce staff are asked to speak at a large number of conferences and other venues. 2017 is taking shape to be a busy year of presentations to assist people in their professional development. Stephen Mally CFRE FFIA will be making the following planned speaking engagements in 2017 (to date). Register today for these, and other, professional development opportunities.